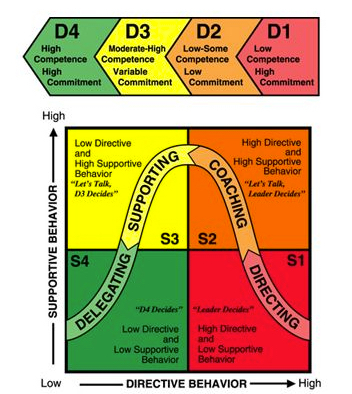 After all these years, I keep coming back to Situational Leadership Styles. It is something that I use all the time in my life. I remember Kenneth Blanchard, himself, introducing the concept at a training course I attended way back in (I think?) 1996. The concept seems simple enough: Leadership is most effective if it is specific to the task or situation, so figure out your situation and than work with who you are leading -- or who is leading you -- to negotiate the best leadership style. It just works and it keeps working. There will never be anything new under the sun that will ever make it an irrelevant approach to leadership. - Has Low Competence and High Commitment to execute a task (the eager beaver; don't know what you don't know category) a Directive Leadership Style is required. This means you are told what to do and when until you develop some competence. - Has Some Competence and Low Commitment to execute a task (now the person doing the task realizes what they don't know) a Coaching Leadership Style works best. The person executing the task IS coming up to speed, but they need lots of help, support, and encouragement. - Has Competence and middle to High Commitment to execute a task (doesn't really need significant Coaching, but still has more to learn) a Supportive or Collaborative Style is ideal. Collaboration at this point can be very rewarding for the person executing the task and for the leader. - Has High Competence and High Commitment to execute the task a Leadership Style that Delegates the task is recommended. This is that hoped for situation when the leader can say: let me know when you're done. I confess that I am completely smitten with these Situational Leadership Styles. As I've said, they are as relevant today as they were last....well....century (yes, that's the 1990's)! - The seasoned leader who needs a bit of guidance in a certain area -- for example, one of my favorites, Project Management: This is where the Collaborative Style fits well. It probably would be insulting and ineffective in this situation, to attempt to be Directive or begin Coaching, unless the Leader has asked for Coaching. The Leader does know about Project Management, but has had some failures recently and knows they are missing something. So how about offering to collaborate with them as they prepare for their next Project Review Meeting. After this preparatory work and after obtaining a better result in their Project Review Meeting, the seasoned leader is back on track with their Project Management responsibilities. - The Millennial who thinks they know everything already, and is too busy checking SnapChat during the sessions you are facilitating to take in anything that you are going over. This the perfect opportunity to point out to the individual that there is a lot that they can teach you, and that Leadership should be situational and task specific, so there are good reasons for them to Lead you in certain areas (leveraging Social Media, etc.). Having said that, it is time to get very specific with the tasks that you want them to accomplish. You may have to start being very Directive -- this is what needs to be done and this is exactly how it needs to be done; here are the standards you'll need to achieve -- but do let them know that as you gain confidence and can see evidence of their abilities in executing the task, you will start to be much less Directive. From here you can gradually move to Coaching, and then to Collaboration. Your Millennial will benefit enormously from being held accountable. You have just helped them become a better employee. The situations where we can all use these techniques are endless and can be quite fulfilling for all of us, if we can only remember that these techniques are available to us.